AECM members have in common the mission of providing loan guarantees for SME’s who have an economically sound project but cannot provide sufficient bankable collateral. Member statistics and studies are part of the activities AECM focuses on and are appreciated by the OECD, the EIF, the European Commission, etc. AECM is primarily composed of full members (cf. article 4 of AECM’s statutes) and is interested in potential new full members whose core activity consists in providing SMEs in Europe with guarantees. 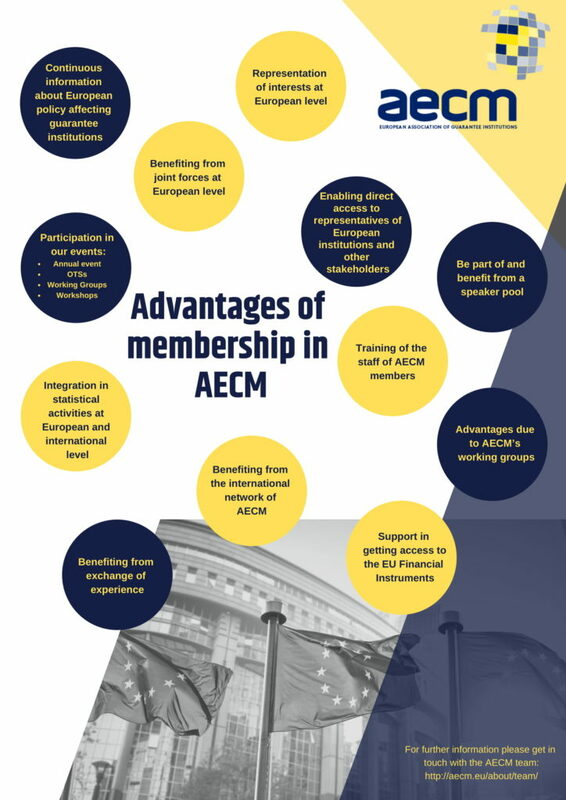 To join AECM there is a requirement that the applying institution is headquartered either in a Member State of the European Union (EU) or in another country provided that such country belongs to the target countries of the European Union as to associations, strategic partnerships, European neighbourhood policy and alike. In addition, such country must be located at least partially within the geographic boundaries of Europe. For institutions applying for membership whose core activity does not consist in providing SMEs in Europe with guarantees and / or which are located in other countries, a partnership agreement may be envisaged. The primary objective of a partnership with AECM consists in the exchange of best practices and in learning from each other. In accordance with AECM’s statutes (cf. article 8) the General Assembly exercises in its own right, without possibility of delegation, the power to decide upon the admission of new members upon the proposal of the Board of Directors. Want to apply for membership? Contact via email the Secretary General Katrin Sturm at katrin.sturm @ aecm.eu. What started out as a small association with 6 founding members, has now become the home of a variety of guarantee organizations from all around Europe. Here below is the history of the development of AECM membership and a general overview of the association’s numbers.